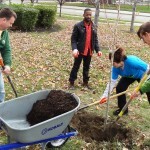 On Saturday, May 12, volunteers, community partners, and family members honored the legacy of the late Senator George Voinovich by planting trees in his cherished neighborhood. A lifetime resident of North Collinwood, the late Senator George Voinovich loved his neighborhood. He traveled the world, but his heart always brought him home to tree-lined Rosecliff Road. “So many of us mourned the Senator’s death in 2016, but his loss was acutely felt in the community where the late senator and his wife, Janet, regularly walked,” said Jim Rokakis, vice president of Western Reserve Land Conservancy. Shortly before he passed, Voinovich commented to a neighbor on how sad he was at the loss of so many trees to the emerald ash borer. 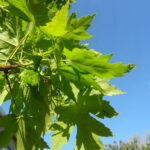 The trees which provided such a lovely canopy for the neighborhood had been cut down. Local resident Linda Schnell helped champion the project. 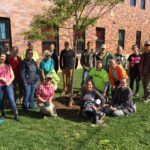 In 2017, Schnell helped organize a series of Sherwick Tree Steward Training sessions for neighbors. More than 30 individuals attended the intensive hands-on training sessions taught by staff from Western Reserve Land Conservancy and Holden Forests & Gardens, where they learned how to plant, care for and maintain urban trees. This spring, Janet Voinovich and her daughter, Betsy, joined Schnell for a community-wide planting day in honor of the late Senator. 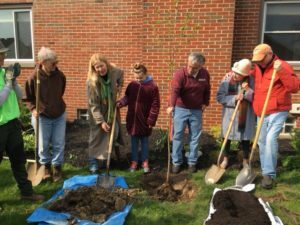 Community volunteers, with the assistance of the Land Conservancy and Holden Forests & Gardens, planted 50 trees on their properties throughout the neighborhood.